Local Businesses Reach 500 Students at Davie Career Expo! 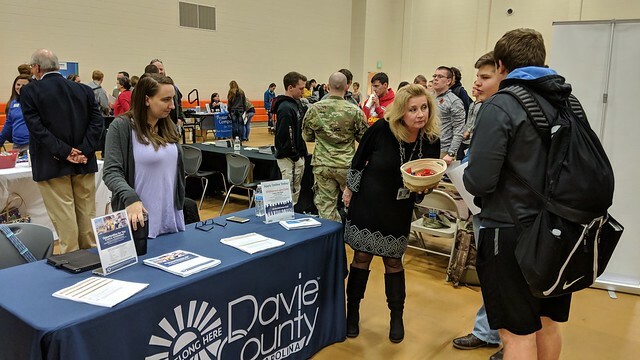 Help students connect with all of the various industries and careers available to them in Davie County. Identify future workforce needs in our community. Align educational programs offered at Davie High and Davidson Community College to meet the needs of our local businesses. Communicate employment needs and necessary credentials to students. Fifteen local businesses and DCCC took advantage of the opportunity to meet with around 500 students and to share what their company has to offer. Participants included: Ashley Furniture, Avgol, Davie Construction, Davie County Government, DCCC, Debbie’s Staffing, Dunlop Tyres, Foster Drug, Gildan, Ingersoll Rand, Members Credit Union, SafetyNetAccess, State Employees Credit Union, The Resource, UTI, Wake Forest Baptist Health. Davie CONNECT and the Davie County Chamber of Commerce were instrumental in organizing the event. Although this year’s career expo is over, there are still many ways for your company to connect with this future workforce. For more information, contact Davis at davisan@davie.k12.nc.us or 336-751-5921 x1015 or Janet Barnes, career development coordinator, at Barnesj@davie.k12.nc.us or 336-751-5905. For more information about Davie CONNECT, a new economic development initiative focused on connecting businesses to resources, kids to careers and providing innovative workforce solutions for Davie County, contact Carolyn McManamy, director, at 336-753-6670 or cmcmanamy@daviecounty.com.